Small arms ammunition, or cartridges, are used in a variety of firearms ranging from pistols to rifles and shotguns to heavier automatic weapons sometimes called machine guns. The term "bullet" is commonly used to describe the cartridge, when in fact, it actually only refers to the projectile. 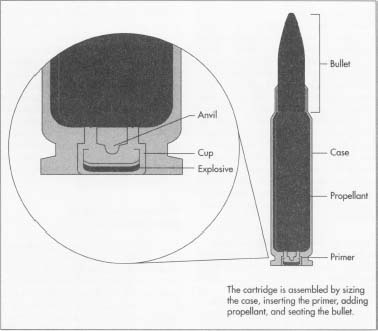 The correct terminology for the cartridge components are bullet, case, primer, and propellant or gunpowder. Each component is manufactured separately and then assembled into the cartridge. Specifications for the size, shape, ignition type, and ballistic performance have been standardized for the majority of military and civilian ammunition, but there are many obsolete and one-of-a-kind "wildcat" cartridges still found. Small arms ammunition includes cartridges with a bullet diameter, or caliber, of up to 0.75 inch (.750 caliber). The bulk of the production is for cartridges with bullets of .45 caliber or smaller. Until the 19th century, the only way to load a weapon was to first pour the powder into the barrel, then place a greased cloth patch around a lead bullet and ram the bullet down the barrel to the powder with the ramrod. A flintlock produced a small spark, or a percussion cap produced a small explosive flash to ignite the powder which fired the patched bullet. This was a very slow process and often produced an inaccurate shot. After repeated firing, the barrel became fouled with powder residue to the point that loading became impossible. In the early 1800s, gun manufacturers realized that increased accuracy and rate of fire could only be achieved by redesigning the way the bullet, powder, and igniter were loaded into the weapon. The first successful new design was made in 1848 by Christian Sharps. His design utilized an opening, or breech, at the base of the barrel closest to the person firing the weapon. The breech could be manually closed to seal off the end. With Sharp's design, the bullet was loaded into the open breech, followed by a powder charge held in a paper bag. When the breech was closed, the bag was cut open. This exposed the powder which could then be ignited by the percussion cap. In 1852, a cartridge with a metal case was developed by Charles Lancaster of England. It held the powder inside the case with the bullet on one end. About the same time, another Englishman, Colonel Boxer, and an American, Hiram Berdan, also developed a metal case cartridge that incorporated an igniter, or primer, inserted into the center of the base of the case. The primer contained a small amount of impactsensitive explosive that could be set off when struck by a pin—known as the firing pin—that was part of the weapon. The concept of the center-fire metal case cartridge developed by Boxer and Berdan has survived to the present day and is the basis for modern small arms ammunition design. Bullets are made of a lead alloy, often containing tin and antimony. Some bullets have a thick jacket of copper over the out-side for improved performance. Many handgun and rifle bullets used for competition shooting are cost using conventional costing methods. The molten lead is poured into the bullet mold cavity, cooled quickly, and then extracted from the mold. The typical brass case is formed from annealed sheet by drawing with a multiple punch and die set. plastic case attached to a metal base. A few handgun cartridge cases have been made of plastic, but have not received wide acceptance. Primers are made of a copper or brass alloy cup with a brass anvil and are filled with an impact-sensitive lead styphnate igniter. The metal parts of the primer are usually nickel-plated to resist corrosion. Propellants can vary from black gunpowder to a more modern smokeless powder which contains nitrocellulose. Propellants are carefully formulated to ignite and create an expanding gas that accelerates the bullet down the barrel. The expansion rate, physical size and shape of the powder particles, and the stability of the propellant are all important factors in the chemical formula used to produce it. Bullets can be made by several different processes. Smaller .22 caliber bullets are usually lead and are pressed, or cold formed, into shape. A small piece of thick lead wire is cut to the correct length and formed into the bullet shape by a die set in an automatic press. High production rates can be achieved by this type of automated process. Many handgun and rifle bullets used for competition shooting are cast using conventional casting methods. 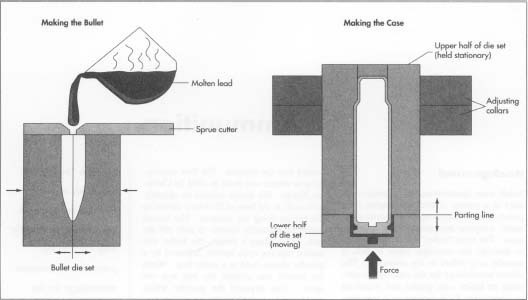 The molten lead is poured into the bullet mold cavity, cooled quickly, and then extracted from the mold. The point at which the lead enters the cavity (or "sprue") is trimmed away as the bullet is extracted. Both cold-formed and cast bullets may be further improved by copper plating. The plating process electrically deposits a thin layer of copper on the outside of the bullet, protecting the lead from oxidation and providing a harder surface to engage the grooves, or rifling, in the barrel which give the bullet a spin to improve accuracy. Copper also reduces the lead fouling of the rifling after firing, allowing the firearm to maintain accuracy after firing many rounds. To improve bullet performance and accuracy, the "jacketed" bullet was developed. This is a family of bullets that use a substantial brass or copper outer shell, usually filled with lead by casting or cold forming, and having several different configurations for specific performance criteria. Some examples are FMJ (full metal jacket), JHP (jacketed hollow point), and JSP (jacketed soft point), each with options such as boattail design, controlled expansion, tracer, incendiary, and armor-piercing. The brass outer shell of these bullets engage the rifling tightly upon firing, providing a close fit for improved accuracy. Designed to further improve accuracy, the boat-tail bullet has the base reduced in diameter to improve air flow and stability in flight. The soft nose and hollow point bullets are designed to expand upon striking the target to intensify their impact. Specialized bullets are sometimes found in military applications. Armor-piercing bullets can be solid brass or copper jacketed steel core. These can penetrate engine blocks and aircraft frames, damaging and incapacitating mechanisms inside. Tracers have a small amount of a phosphorus compound in their base. Upon firing, the phosphorous ignites and burns with a bright light. At night they can be seen streaking away from the firing position towards the target, allowing the shooter to track the bullet in flight and make aiming adjustments. Incendiary bullets contain small amounts of magnesium, which, like phosphorous, burns when ignited, but stays burning for a longer time and causes ignition of fuels or ammunition upon impact at the target. Nearly all small arms ammunition cases are of brass alloy. Some use aluminum, steel, or plastic, but the brass case is most popular and easiest to manufacture. The design of the case is determined by the firearm in which the ammunition is used. The typical brass case is formed from annealed sheet by drawing with a multiple punch and die set. The first stage of the multiple die set forms the metal, the second stretches the metal deeper, the third forms the rim, and so on. Each step stretches the metal slightly farther until the final stage produces an accurately formed case. The cases are trimmed to length and the primer hole is punched. Heat treating and stress relieving are performed to selected types of cases to improve durability. This is accomplished in large batch ovens, where baskets of cases are heated with enough temperature to gently soften the metal without distorting it. When cooled, the metal is "relaxed" and better able to take the punishment of firing. Some handgun caliber cases are nickel plated for durability in reloading, corrosion resistance, and for appearance. Each case is stamped with information such as caliber, manufacturer, munitions codes, and year of manufacture. The primer consists of two metal parts and a small amount of explosive compound. Primers come in different sizes depending on the firearm. Using a small pistol primer as an example, the cup is usually about 0.125 inch (0.32 cm) in diameter and 0.125 inch (0.32 cm) tall, and made of soft copper or brass. Inside is placed a small amount of the impact-sensitive explosive lead styphnate, and pressed into the opening is a triangle shaped piece called the anvil. When struck by the firing pin, the center of the cup collapses, squeezing the explosive between its inner surface and the anvil. The explosive ignites and shoots a flame through the flash hole, igniting the propellant to fire the cartridge. forms the metal case to standard dimensions. The case must be within 0.001 inch for it to function correctly. 2 The primer is then pressed into the case primer hole flush with the base. The primer must be flush or the cartridge will not feed properly in the weapon magazine, causing a "jam." At the same time, the mouth of the case is slightly expanded, in preparation for receiving the bullet. 3 The case is "charged," or filled with the correct amount of propellant. This step is of utmost importance, for miscalculation or double charging could be disastrous. 4 The bullet is firmly seated into the open end of the case. The bullet has a coating of lubricant to prevent corrosion and assist in the assembly process. The bullet is then crimped into the case to give the correct overall length of the cartridge. The crimp reduces the diameter of the open end of the case and captures the bullet tightly, sealing the assembly together so moisture cannot invade the powder. The press used to assemble cartridges must feed each component accurately and in the correct sequence. Otherwise, cases could be unprimed, powder left out, or bullets seated incorrectly. Any of these could result in a misfire or loss of accuracy at the minimum and, at worst, cause the firearm to blow apart upon firing. In each stage of the process, special dies perform the important assembly function. The dies are made of tooling carbide for long life, and have close adjustments to produce quality ammunition. After assembly, the finished cartridges are packaged, usually 50 to a box, and prepared for shipment to the shooter. Most manufacturers shoot thousands of their own cartridges as part of their quality control programs and processes. The accuracy, pressure, reliability, velocity, and consistency are all recorded. The weapons used for this are specially made, highly accurate, and equipped with data-gathering electronics. Each production run of a particular cartridge is given a "lot code." This number, printed on the ammunition box, allows ammunition to be inventoried and traced. Should a particular lot show problems in the field, that group can be recalled and replaced using the lot code system. Small arms ammunition will be available in its present form for the foreseeable future. Its function will continue to be to propel a projectile over a distance to strike a target. Variations in the material and design of this ammunition will be in response to the specific needs of the many groups of small arms users. The military will continue to develop ammunition which can penetrate and incapacitate a wide variety of targets ranging from humans to sophisticated electronic equipment. Currently, they are investigating "non-lethal" weapons and ammunition which will incapacitate a target without destroying it. Small arms weapons in this category include hand-held chemical lasers to knock out electronic sensors, and foam guns which shoot a sticky foam that envelops the target. These non-lethal devices would supplement, not replace, the conventional small arms weapons and ammunition. Police are also interested in non-lethal weapons and ammunition. Rubber bullets that impact without penetration are already in use for riot control. Another device is a shotgun which fires a small bean bag. When fired at a close range, the bean bag hits with the impact of a punch to momentarily incapacitate the target. Hunters will want ammunition which hits accurately and kills with a single shot. Much of the development of commercial small arms ammunition has been in this area, and has included many variations in powder loads and bullet configuration. Target shooters will continue to develop ammunition which offers excellent accuracy and repeatability for competition shooting. Bames, Frank C. Cartridges of the World, 6th ed. DBI Books, Inc., 1989. Hackley, F.W. History of Modern U.S. Military Small Arms Ammunition. Macmillan, 1967. Gresham, Grits. "Nosler and His Partition." Sports Afield, December 1992, p. 40. Langreth, Robert. "Softkill." Popular Science, October 1994, pp. 66-69. This page was not good for me because I was in search of the "what kind of a chemical bullet contains". I am interested in learning how to make steel shot for BB guns and shotgun shells. I recently heard that a US supplier of BB guns takes a C1006/08 steel wire that is .165" in dia and cuts it into slugs, then puts it in a tumbler. I am interested in knowing if this is how its done, what size slugs yields a particular shot size and what media is used when tumbled. and how long its tumbled. If I have this process wrong, maybe someone can help me understand how its done.